Quentin Ball was born in England on Valentine’s Day in 1946. He left home at 21 to travel the world and discovered black-and-white photography in a kibbutz darkroom in Israel as an outlet for his personal creative expression. By the early 1970s, Mr Ball had moved to the United States. He trained as a professional photographer and settled in Dallas. He found the American Southwest to be particularly challenging to photograph, especially the canyons and sand dunes of West Texas, Colorado, Arizona and Utah. Mr Ball returned to his native Britain in 1992. He is an Associate of the Royal Photographic Society, and is a past Chair of London Independent Photography (LIP), a group of 200 photographers interested in developing their own personal approach to photography. In 1998, Mr Ball conceived Countdown 2000, an ambitious project involving 40 LIP photographers who captured Greater London on every day of 1999, the last year of the 20th century. Managing the project, he helped to secure a Millennium Awards for All lottery grant for a showcase exhibition of the 365 selected images during the Millennium year 2000 at the gallery @ OXO on London’s South Bank. 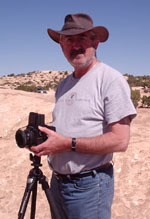 Mr Ball has made numerous trips to the American Southwest and regularly leads groups of photographers to this and other areas of outstanding photographic possibilities. The peace and serenity of the haunting desert landscapes continue to shape his creative work, emotions and his personal philosophy.